Believe it or not, this ginormous plate costs just $18! And all this can be yours with Ellenborough Market Cafe‘s latest One-Plate Lunch Buffet deal. 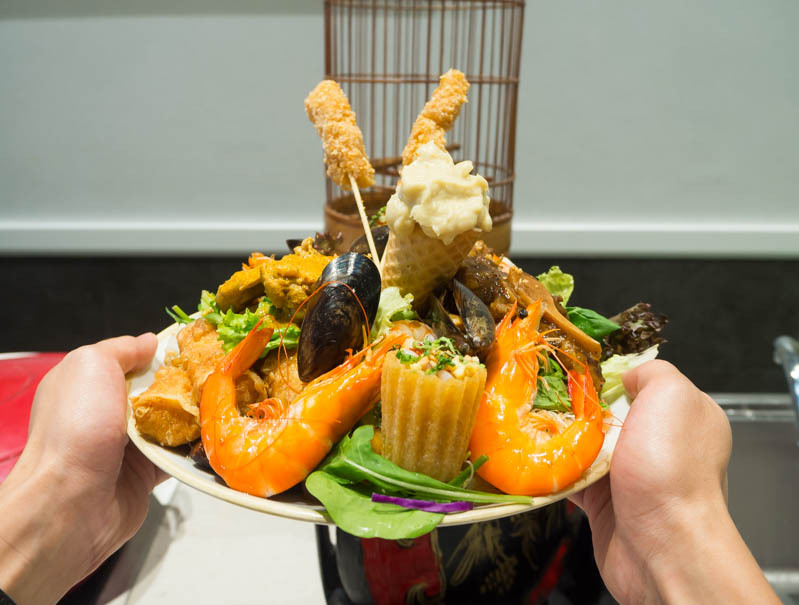 Housed within Swissôtel Merchant Court, Ellenborough Market Cafe boasts one of Singapore’s best buffet selections, with over 40 international and Peranakan dishes. The usual price is $52++ per pax, but here’s a way better bargain. For just $18++, you can delve into the buffet spread, as long as you keep all your food on one plate! It may seem daunting, but here’s how we managed to get the most value out of this insane all-you-can-stack buffet. With limited space on your plate, you’ve got to plan. The buffet line is made up of three distinct areas — international, Peranakan and dessert. The international section was filled with Japanese sushi and sashimi, a roast station, salad bar and more. There’s even fresh seafood on ice brimming with mussels, prawns and clams. But all I saw were the dollar signs I was saving on. The Peranakan section is decked out with rustic Asian ornaments that create a nostalgic feel. Here, you can have a hand at the DIY Kueh Pie Tee station and also try out their signature Peranakan dishes. With limited plate space, you can either go for the try-all-the-dishes route, or just spend the meal hogging the sashimi station. Tempting, but I was feeling extra greedy so we chose the former instead. Stacking the most food on your solitary plate is a little like building Jenga; you’ve got to consider the physics. Disclaimer: you may find the following images disturbing. Lay a stable foundation by choosing flat foods that won’t topple your tower. Our ‘bricks’ were my favourite sashimi, followed by juicy char siew slices from the roast section and assorted maki. Next, think vertical. Just like in real estate, vertical space is more valuable with limited land plate space. I was a little iffy about different food items touching, but then I remembered I was a broke twenty-one-year-old and started piling more food on the plate. Our solution: Use the salad to separate the different layers of food. The spinach leaves also did well to flood-control the different sauces so we wouldn’t compromise on the integrity of the food. Sashimi with Nonya curry? Yucky. Our final advice may sound like a Ted Talk — be creative. If there ever was a time to play with your food, this would be it. We actually snuck over to the dessert counter and used the ice cream cones as little bowls for our food. Bring on the disgust, but we saved space by jamming cones into the side. With over 20 items on our plate, our stacking took almost 20 minutes to complete. We would have gotten more, but the plate started getting heavy, and my friend compared it to the weight of a Macbook (the old Macbook Pro, not Air). Apart from looks of contempt from other diners, I’d say this was a success. I strongly recommend the indulgent Babi Assam. Their rendition of this Peranakan delicacy comes with deliciously braised pork belly served in assam juice that was a balance of both sweet and salty. The pork was adequately fatty and definitely deserves generous space on your plate. You absolutely cannot miss their signature DIY Kueh Pie Tee, where you can make it to your own liking. It’s so good, I actually saw a diner fill his plate with nine! The shell was crisp, but do leave it for last as the shell soaks up the sauces fast. Just don’t forget the chilli; it’s just the right amount of hiam-ness (spiciness) and zest. I was craving something with spice so I went for the Nonya Chicken Curry. The flesh was succulent and fell off the bone. But the star was the luxurious yellow curry that was creamy and aromatic. If you’re extra hungry, you can even carve up an entire fish. We had the steamed Garoupa with Nonya Sauce, which was seriously soft and tender. The sauce also had an appetising sour tang, perked up by a lingering spice. You heard me right, $4 for endless desserts. Here’s the best part: unlike the one-plate buffet, this dessert buffet is unlimited! Go for plate after plate, two purple notes are your golden ticket to Ellenborough’s magical chocolate factory. So activate your dessert stomach and feast! Head over to the confectionary display and instead of ogling, just reach in and take. Filled with decadent chocolate swiss rolls and dainty sponge cakes galore, it couldn’t get any better. Or so we thought. The star of the desserts was actually the traditional Peranakan selection. With Assorted Nyonya Kuehs, Durian Pengat and more, these sweet treats are worthy of your limited stomach space. You absolutely cannot leave without trying the famous Durian Pengat. Their version had a thick, creamy consistency and was pleasantly not too pungent. It also wasn’t too cloying, so you’ll be able to fill up on it. I don’t even like the prickly fruit, yet I found myself returning for seconds! Don’t miss all the old-school Assorted Nonya Kueh either. While the Kueh Salat could use a little more coconut milk, the yellow Kueh Bingka did not disappoint. It was buttery yet light, and had bits of grated tapioca that added texture. My favourite was the Sagu Melaka, which balanced the burnt caramel-like sweetness of the gula melaka with a light ginger spice in the white rice layer. Good news, you won’t have to wait for the Lantern Festival to eat Ah Balling. The white glutinous balls had a bouncy texture similar to mochi, served in a gingery peanut soup. But the best part was the generous peanut filling, which had a strong roasted flavour and delicate sweetness. Then there was my favourite, Muah Chee. Prepared a la mode, these sweet glutinous rice balls were coated in plentiful peanuts and weren’t too chewy. Be kiasu and grab a few at a time as they disappear the second they are out! Tried and tested, this all-you-can-stack buffet is the latest way to feast without splurging cash. For just $18++, I dare you to find a better bargain in town. Take it from two hungry guys, who could barely finish even one plate. Hungry? The One-Plate Lunch Buffet is available all-year round.